2007 Thabo Mbeki signed those “agreements” of the Khoisan areas, and it was during his time it was handled. The biggets land-claim in South Africa’s history was – and is – wrapped up in a scam involving a community leader and his family. (Listen to the video material – everything they received with the landclaim). Tears of joy flowed on Tuesday when the Richtersveld community finally won back the diamond-rich land taken from them almost a century ago. The restoration of the land was part of a settlement agreement confirmed by Land Claims Court Judge Antonie Gildenhuys, sitting in Cape Town. Only one of more of the CPA communal lands and land claims. Important to note – CPA’s must be registered under that legislation with all landclaims in South Africa. Those communities voted their own leaders in this CPA’s. The order came after the state, community representatives and a dissident Richtersveld Action Committee reached agreement on the terms of a settlement. 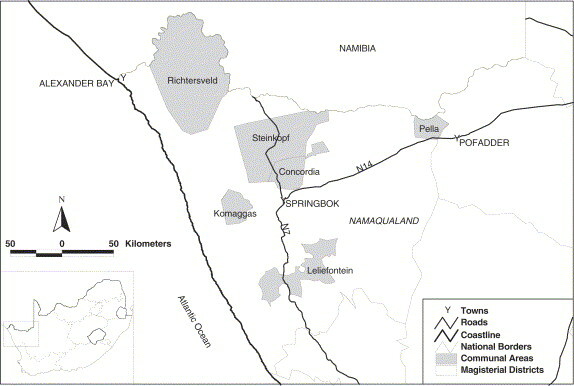 The community in 1998 lodged its claim to the land, which included compensation for diamonds extracted from it since the 1920s. The settlement will see the state hand over to the community 194 600 ha, including an 84 000 ha coastal strip of diamond-bearing land currently being mined by the ailing state-owned Alexkor. The state will make an “extraordinary reparation payment” of R190-million to a community-owned investment company, a R50-million development grant and also transfer Alexkor’s farming operations to the community. Alexkor and the community will enter into a joint mining venture, in which Alexkor will hold a 51% interest, to which the state will contribute up to R200-million in capitalisation. The mine-owned town of Alexander Bay will be transferred to the community, and Alexkor will pay R45-million to continue housing its staff there for the next decade. Handing down the order, Gildenhuys said it would not immediately undo the injustice that had been inflicted on the community. For that, the Richtersvelders’ own hard work and mutual cooperation would be necessary. “The community is entitled to a better life, and this court order puts that within their reach,” he said. Gildenhuys paid tribute to the lawyers who worked on the claim, singling out attorney Henk Smith of the Legal Resources Centre, who he said had pursued the community’s case with great determination over the years. Diergaardt, who heads the Richtersveld’s Communal Property Association (CPA), said some aspects of the agreement were already being implemented. The CPA committee would now report back to the community, begin further planning, and on December 1 hold a celebration. “And I can promise you it will not be a little celebration. It will be a celebration like South Africa has never seen before,” he said. The action committee, which entered the fray only as the CPA and the state were seeking Gildenhuys’s approval of the settlement, was represented in court by Lawyers for Human Rights (LHR). It claimed the terms of the settlement, signed by CPA leaders and Public Enterprises Minister Alec Erwin in April, were problematic and that the document had not been properly approved by the community. LHR national director Rudolph Jansen said the main concession made to the committee was that all Alexkor’s obligations were now underwritten by the state. This was particularly important for rehabilitation of decades of environmental damage caused by mining operations. In addition, a range of “good governance” clauses had been inserted in relation to the myriad community trusts and companies that were being established. It is estimated that the state has spent in excess of R50-million in legal costs in fighting the Richtersveld case. Khoisan het dus heelwat grondeise gehad, wat Trustgebiede heet, daar is amptelike dokumentasie en is in Hansards asook “wetgewing in wording” vervat. Grondeise val onder die CPA wetgewing en dit is duidelik slegs kommunale grondgebiede – dis nou die Trustgebiede wat die ANC gebruik en dan agterna word genoem dat hierdie mense geen grond het nie. Alles leuens. Hulle het grond. Niemand van ons blankes het ‘n vinger gelig om CPA wetgewing te skryf nie. Duisende hektare grond is al vervat in grondeise, nie net deur swart etniese volke nie maar ook Khoisan volke. It was mentioned in the video what they have received to farm.